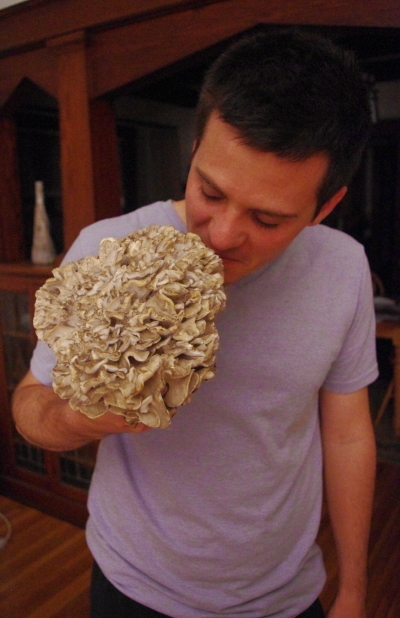 Apparently Kyle has been looking for a fantastic mushroom named Hen of the Woods, since he got into mushroom hunting. 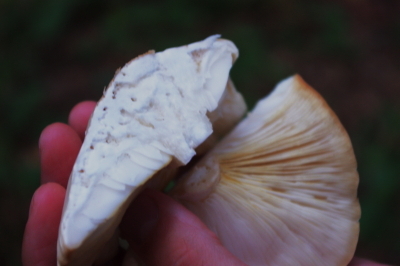 It is supposed to be very tasty and good for the immune system. He had hitherto only seen one that my sister would not let him eat because it was growing right in someone’s yard, and they worried about herbicides. 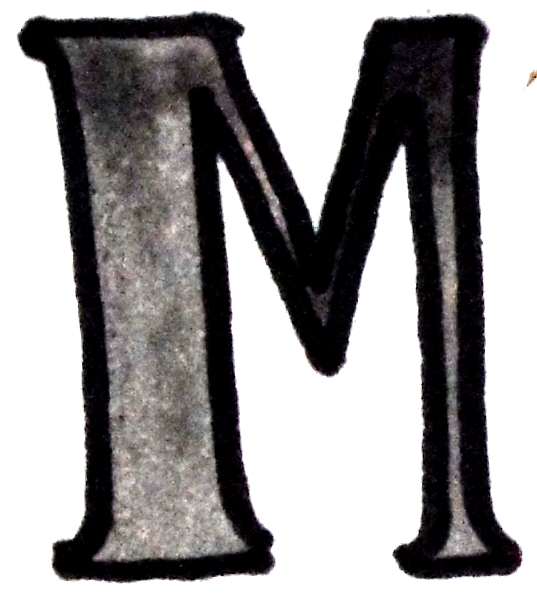 When he told my sister he had found at the farm, she said it was incredible that it had been under their noses this whole time. 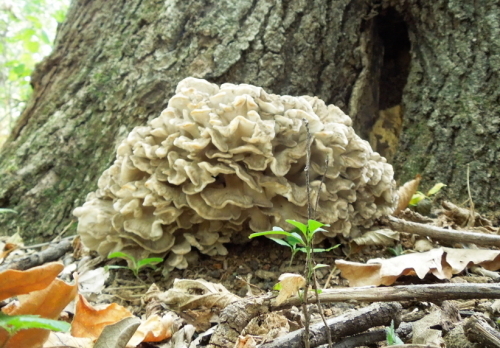 The Hen of the Woods grows at the base of oak trees and rather that being a decomposer lives in a symbiotic relationship with the trees. It gets feed by the tree but also produces things useful to the tree that it wouldn’t get otherwise. It is hard to see in this picture because its color and texture blends right in with the oak tree bark and the ground. 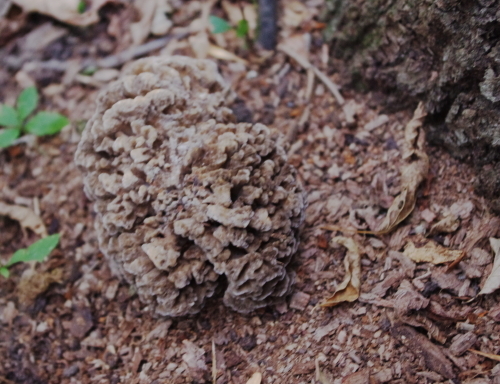 This specimen was not grown enough to harvest, it’s many folds of feather-like ruffles had not yet opened up. So Kyle asked me to keep an eye on it for him and harvest it later. 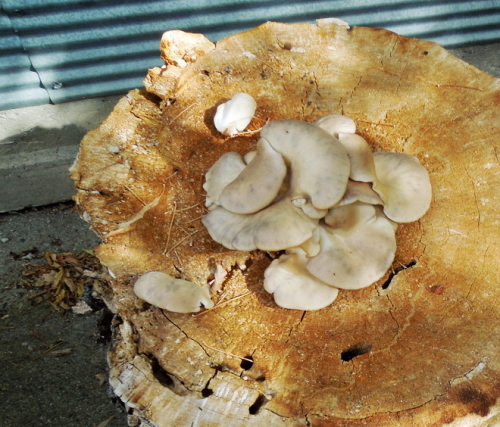 Kyle told me, as long as the mushroom is still growing (before it goes to spore) the surface of it will feel cool and moist. A few hot days later, on Tuesday it was a lot larger, fully opened, and no longer cool to the touch. So I brought to an excited Kyle and my sister made some into soup with wild rice. 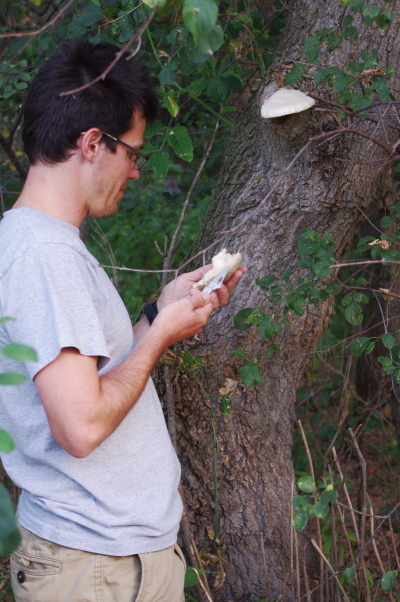 Kyle and Christy have friends from Spain who told them in Catalonia wild mushroom hunting is a wide-spread past-time. They told them to be glad not many people here are interested in it because in Spain much of the forest is disturbed and wrecked by the volumes of disrespectful mushroom hunters.